Gone Fishin' - Icebreakers, Icebreaker Ideas, Games, Activities! Gone Fishin is a group game based on its board game counterpart of the same name. In this game, you will need to be the player who catches the most fish in order to win. This game will work best with large to extra large groups and will require players to switch roles frequently. This game may best be played at an event or party where space will be accessible. First, start by picking a big open space that plenty of people can fit into; you’re going to need a lot of room to really make this work. Next, you need to create four fishing rods using the string and sticks, make sure that the string is tightly attached and won’t fall off when pulled on. Depending on the general height of your participants make the string long enough to reach from their waste to the floor. Finally, pick a song with a steady beat. It may help to put markers or tape x’s on the floor if your fish are younger so they know where to sit and fill in. *Make sure to have multiple songs on stand-by to change things up each round! Gather everyone together in a tight circle and pick four players to be the fishers. The rest of the players are going to be the fish for the game and you can rotate out these rolls as you go. Instruct the fish to open and close their hand to the beat of the music playing. The fishers have to get the string safely into the fish’s hands in order to score a point. When a player catches a fish the fish will then join them on their side of the room. The game will end when the song ends or when all the fish are caught.Lastly, the player can get as close to the fish as safely possible, but can not touch the string in any way other than indirect contact through the fishing pole. * Hard mode: Assign colors to the player and the fish. The player can now only catch a fish of the same color as theirs and can only win by catching all of their fish. For this version of the game, you may want to get the player to rotate occasionally throughout the song. Listen to the beat of the music and get your movements in sync. Pay attention to the players that are most in sync as well these will be the easiest fish to hook. If you are feeling to pushed you may not get many fish; relax and only throw your line in when you feel confident you will catch something. If you are matching colors be sure to visualize where all the players you need to catch are before you start casting your line. Free ideas & step-by-step instructions to icebreakers, fun games and team building activities for classrooms, workplace and corporate training, youth group activities, party games, college group activities or games for kids. Enjoy! And also check out our learning theories summaries, educational game design resources, group games, great group games, and how do you play party games guide. 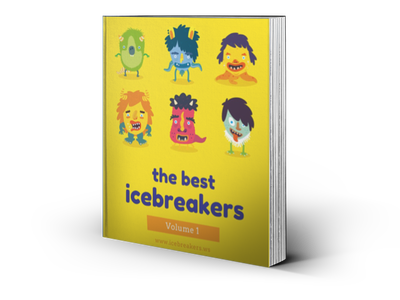 Buy the Best Icebreakers eBook! Get the Best Icebreakers eBook instantly for only $5.99! Read all the game guides in a convenient PDF format with no ads. Buy safely and securely with Paypal or a major credit card! Learn more about our eBook! Great Wind Blows - Icebreakers,Ideas, Games, Activities! Hot and Cold Game - Icebreakers,Ideas, Games, Activities! Group Juggling - Icebreakers,Ideas, Games, Activities! Human Rock Paper Scissors - Icebreakers,Ideas, Games, Activities!